We supply three standard models of end-formers, the ATT620, ATT630 and the ATT640. These are based upon the popular design of the Roborough Vaill end formers that have been in the marketplace for many years. In addition to being one of the most cost effective end forming machines on the market, if space is tight, it’s good to know all our end-formers have a smaller footprint than many of our competitor’s machines as well! 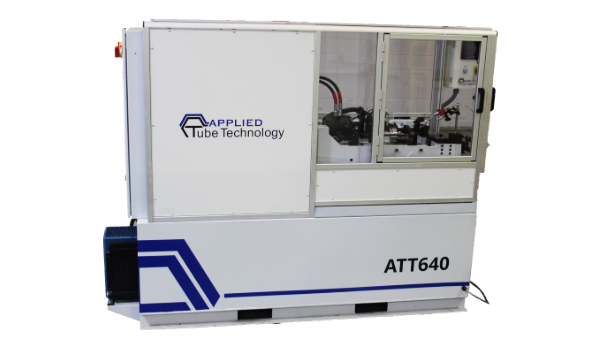 The ATT620 is a two-station end-forming machine, the ATT630 has three, and the ATT640 is a four-station machine, so we have a solution for every requirement. These machines use hydraulic cylinders to generate the necessary forces during clamping and forming operations, utilising a pneumatic flag stop mechanism. The Roborough style ATT end formers are one of the most robust and long lasting machines it’s possible to buy, we have TPM packages in place for machines that were built over 25 years ago and still running well today! New all electric models coming soon! The all new ATT-E models are our latest generation end-formers. Still keeping many aspects of the popular Roborough design, we have upgraded the machines to offer an all-electric solution. After many requests from customers to develop this type of machine, we are pleased to say we expect this product to launch during 2019. All machines are available in a choice of colours. White as standard. Cast iron body for extreme durability. Accurately machined slideways for precise movements. Omron PLC control fitted as standard. Adjustable positioning of flag stop mechanism. Electrical touch sensor for flag stop. Integrated hydraulics to reduce footprint. Automatic and manual cycle options. One-shot machine lube system to increase machine life. All machines come with an 18-month full parts and labour warranty. The warranty does not cover tooling which are deemed to be consumable items.